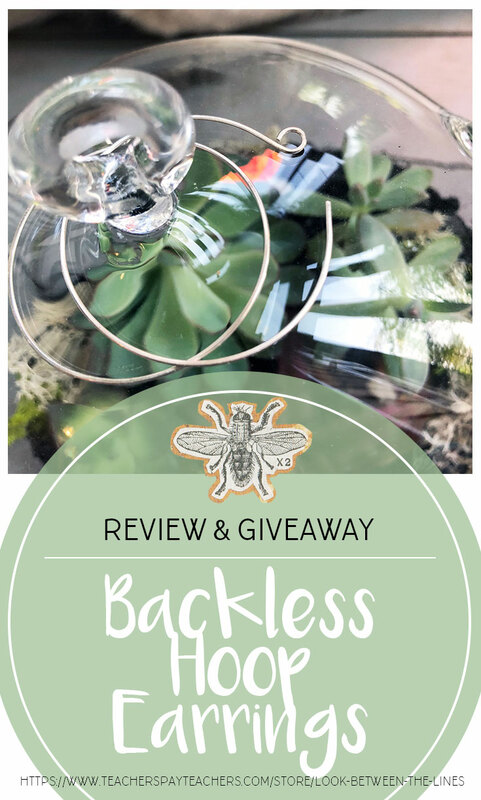 I was recently contacted by April Williams of Eluna Jewelry Deigns to do a review of her hoop earrings. 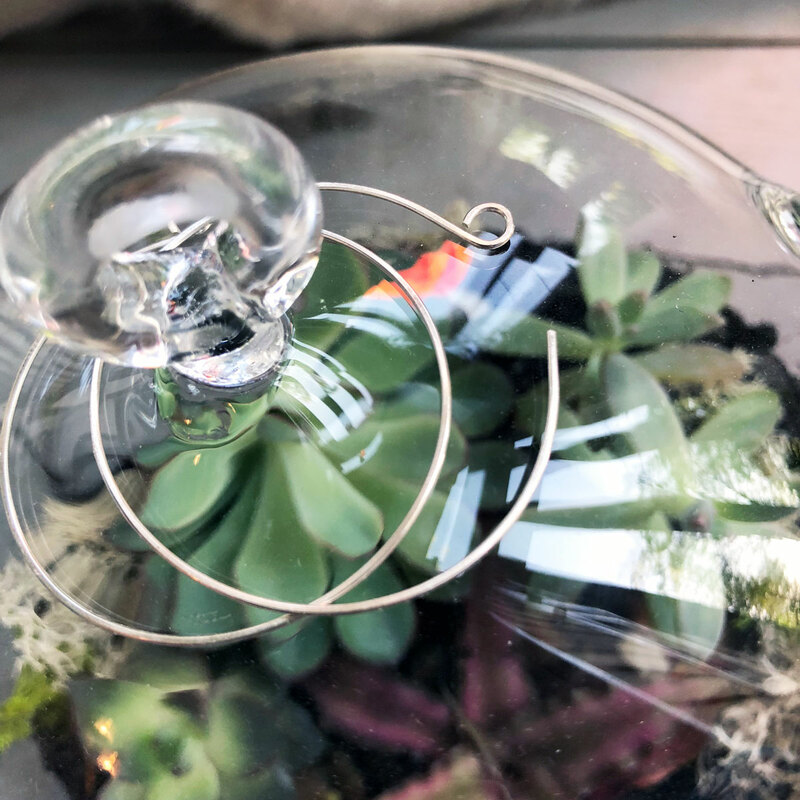 It has been a long time since I have blogged about product reviews and I love to help out fellow Etsyers, so I jumped at the opportunity. When I first opened April’s e-mail I saw basic hoop earrings. I immediately thought to myself, they look nice, but what makes them special? I then noticed a little loop at the end of the earring, rather than a straight piece and back clasp. After reading through the details I realized these hoops were clasp free. As a very bad jewelry owner, clasp free anything is ideal. I have lost so many earring backs simply taking my earring off. There must be a black hole hidden in the tile of my bathroom. As the earring back falls I hear the final “ping” as it hits the floor, never to be heard from or seen again. Then there are the days where halfway through my workday a student will ask why I only have one earring on. Somehow they jump out of my ears and with my daily routine of being everywhere on campus, there is little to no chance of recovery. Long story short, I was on board with this product before April shipped it to me. I couldn’t quite grasp how these would work, I am a visual learner, but figured it couldn’t be too complicated. April shipped them out and I eagerly awaited their arrival. 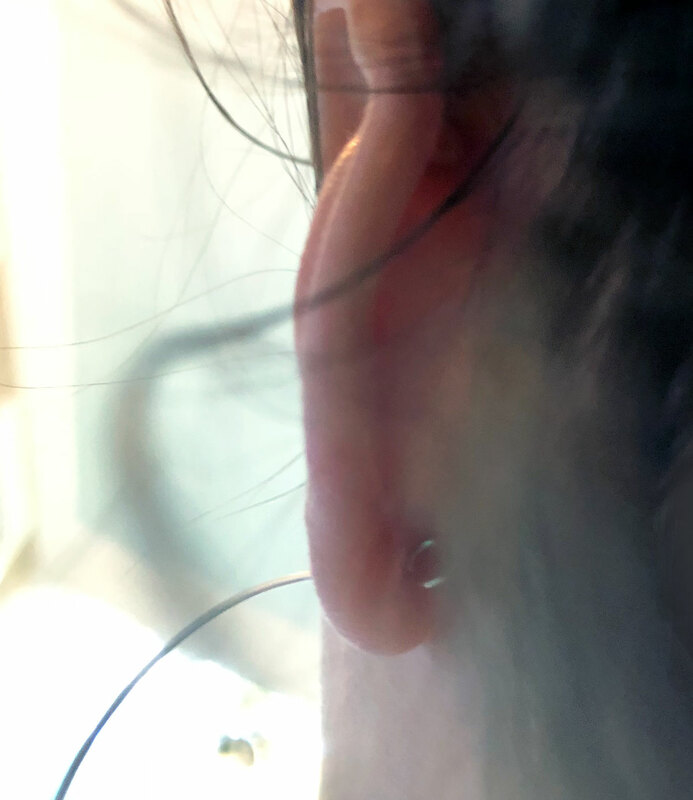 I opted for the medium size sterling silver backless hoop earrings. All of her products are made from quality metals such as sterling silver, 14 kt gold, copper, and niobium, a metal I had never heard of. I learned it is a hypoallergenic metal that can come in multiple colors. Since I am lacking a set of hoops (crazy, I know) in my earring collection, I thought this was the best way to go. I also like to review the “bread and butter” products of a seller, since these are typically the most moved and most popular items. As soon as the package arrived I handed the babies over to my hub and ran upstairs to try them on. The package included instructions, the earring should be placed through the back of my earring hole. What should have clicked as soon as I pulled up images of her jewelry finally clicked when I had the earrings and instructions in hand. You thread the non-loop end through the back of your ear and the loop rests agains the back of your lobe. My immediate reaction was, “well this isn’t going to be easy.” But it was much better than I expected. It only took a few tries to line it up before it came through. Since then I have gotten much better at the process, and I have to admit I have had a lot of practice wearing these over the last two weeks. The size was just what I was looking for and the wire is nice and thin. The earrings are incredibly light and look delicate. It’s so nice to have this basic style in my collection, they have become regulars in my rotation. I am also a big fan of the fact that April makes and ships these out of Raleigh, NC. I love supporting fellow artists and local, handmade, southern products. Her prices are extremely reasonable, this style lists for just $20. In addition to sending me a pair to try out, April has also sent me a pair to giveaway to one lucky reader. All you have to do is visit April’s Etsy shop here or website here and comment below with your favorite item. 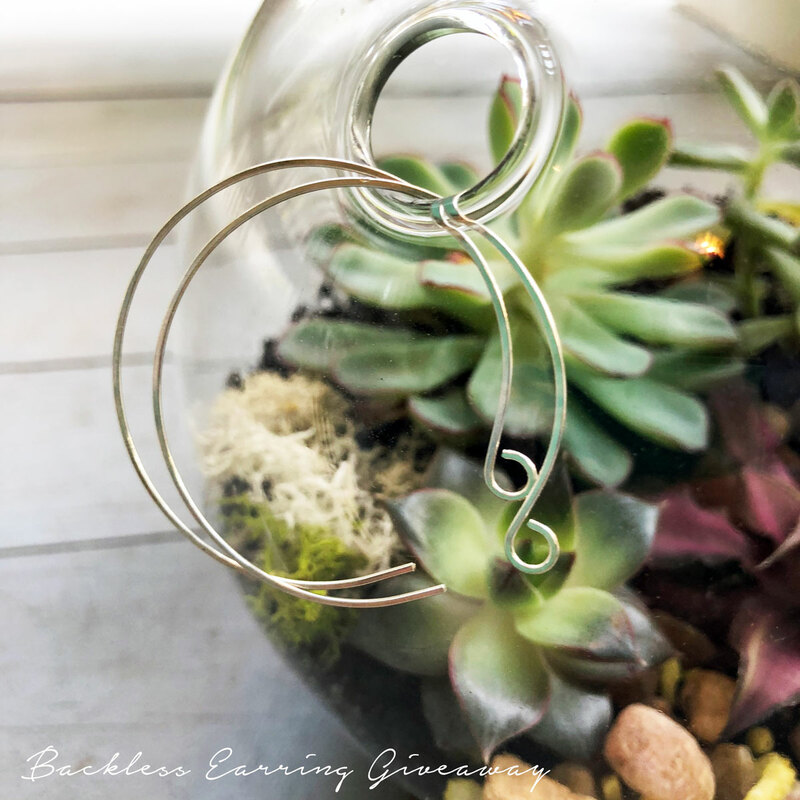 You can get one bonus entry if you subscribe to my blog (simply fill out the form at the bottom of this post) and follow her Etsy shop, comment again letting me know you are following both of us. The winner will be randomly selected on Sunday, April 29th. They will have 24 hours to respond to my e-mail before another winner is selected. Thanks for taking the time to check out my latest product review and read my blog! Check out my other posts here, teaching products here, and my Etsy shop here. Thanks for stopping by!